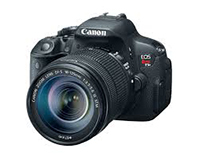 The Canon Rebel Ti Cameras are DSLRs that can take photos and video. Gelardin carries the Ti3, Ti4, and Ti5 models. Use our handy compatibility assistant to see which of our microphones work with this camera. Instructions on how to convert RAW files.